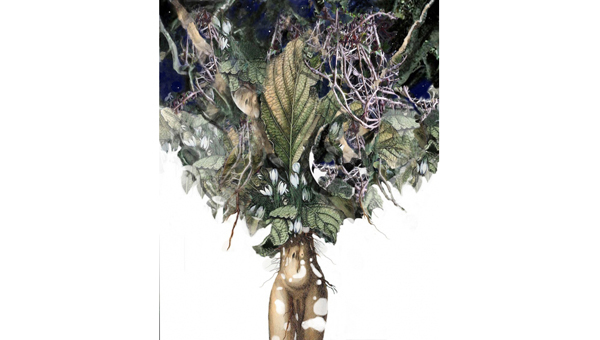 Poet, sculptor, and performance artist B. Catling's debut novel, The Vorrh, was released on 15 November 2012 by Honest Publishing, and takes its name from the imaginary African forest in Raymond Roussel's “Impressions of Africa”. The bow I carry with me into the wilderness, I made of Este. She died just before dawn, ten days ago. She had seen her death while working in her garden, saw the places between plants where she no longer stood, an uncapping of momentum in the afternoon sun. She prepared me for what had to be done, walking back into our simple house and removing her straw hat, returning it to its shadow and nail on the north wall. She was born a seer and some part of her seeing lived in the expectancy of her departure, a breeze before a wave, before a storm. Seers die in a threefold lapse, from the outside in. The details and confinement of each infolding had to be carefully marked and heard without panic or emotion on my part, for I then took on a different role. We said goodbye during the days leading to her night. Then all of my feelings were put away; there were more important rituals to perform. All this I knew. From our first agreement to be together it had been described, it had been unfolded. Our love and companionship grew in the confines and the constantly open door of its demand, and secretly I rehearsed my distance and practised the deceit of loneliness. As I stood before our solid wooden table with her blood drying stiff on my skin, her body lay divided and stripped into materials and language. My back and hands ached from the labour of splitting her apart, and I could still hear her words. The calm instruction of my task repeated over and over again, embedded with a singsong insistence to erase my forgetfulness and its fence of doubt. The entire room was covered in blood, yet no insect would trespass this space, no fly would drink her, no ant would forage her marrow. We were sealed against the world during those days, my task determined, basic and kind. She had explained all this to me while I served her breakfast on a rare rainy morning. The black bread and yellow butter had seemed to stare from its plate with mocking intensity, the fruit pulsing and warping into obscene ducts and ventricles, vivid in innocence at every direct glance. I perched on the edge of the bed, listening to her simple words glide and agree with the rain, while my fear ignited them into petrol wires of ferocious anger, stuffed into my oxygenless, hidden core. I shaved long, flat strips from the bones of her legs. Plaiting sinew and tendon, I stretched muscle into interwoven pages and bound them with flax she had cut from the garden. I made the bow of these, setting the fibres and grains of her tissue in opposition, the raw arc congealing, twisting and shrinking into its proportion of purpose. I removed her unused womb and placed her dismembered hands inside it, sealing the misshapen ball which sometimes moved a little in its settling. I shaved her head and removed her tongue and eyes, and folded them inside her heart. My tasks finished, I placed the nameless objects on the wooden draining board of the sink. They sat in mute splendour, glowing in their strangeness, untouched by any criminal light. What remained on the table and floor was simply waste. I left it for the wild dogs when I departed that place with all its doors and windows open. For three days I lived with the inventions of her and the unused scraps, the air scented by her presence, the musk-deep smell of her oil and movement. The pile of her thick, unwashed hair seemed to breathe and swell against the bars of sunlight that turned the room towards evening. These known parts of her stroked away the anxious perfumes, the harsh iron of her blood and the deeper saturated smoulders of her unlocked interior. On the third day I buried her heart, womb and head in the garden in a small, circular pit she had dug with her very hands a week before. I buried the compass of her and covered it with a heavy stone. I obeyed with perfection, tearless and quiet, picking up the arrow that she had made and walking back into the house for the last time. or laid next to her, fascinated and horrified, aroused and entranced as the procession gently disgorged. Her eyes waxed and waned memory, pale transparency to flinted fire. She was dimly aware of me, but able to instruct and explain the exactitude of the process. She did this to dispel my anxiety and pain; also to confront the ecstasy of her control. In the evening of the third day, the memory in my dreams began to show itself. It refined our time together, the constancy of her presence. Since leaving her village, we had never been apart, except for those strange weeks when she had asked me to stay inside while she dwelt in the garden day and night. When she returned, she was thin and strained. The bow is turning black now, becoming the darkest shadow in the room. Everything is very still. I sit holding the two wrapped arrows in my hands. Out of their turnings comes hunger and sleep, forgotten reflections of my own irredeemable humanity. From the cupboards and the garden I juggle anticipant food, flooding my senses with taste and smell. Citrus and bacon rise in the room, sage and tomatoes, green onions and dried fish unfold. Separation has been hewn by the essential, and a long, dreamless sleep waits to sanction it. My hands tremble holding the bow and the morning door, the arrows between my teeth. The exact moment has come, and I wrench into dazzling light, the ancient wood sucked inwards and falling from its twisted hinges. Overwhelmed, the house gives up, showing its previously unseen squalor as an act of submission. Heat, buffeted by a bright wind, wakes me to this world and seals the shrivelling house to a hollow. I untie the dark, dry leaves from the arrows while holding the bow cradled to my chest. They are white; an infinite, unfocused white without any trace of hue or shadow. They absorb the day into their chalky depth and I grow sick looking at them. I lift the bow, which I must have strung in my sleep, and knock one arrow into its contrast. The other is wrapped away and saved to be the last. I would make many in between. This is the moment of departure, her last instruction. I draw the bow back with all my strength, and feel this single gesture brace every muscle of my body, feel the tension lock in as the grace of the string touches my lips. Pulling the great curve silences the world and even the wind stops to hold its breath against my energy and the release. For the first and last time, the bow is silent, except for small, creaking sighs that echo my taut bones. I raise it skywards, perpendicular to the track that runs over the low foothills in an almost vertical scar from our home. It lets itself go, vanishing into the sky with a sound that sensually pulses through me and every other particle of substance and ghost, in or out of sight. I know I will never see that arrow again. It is not to be my guide; I will have to make that one differently. That first white arrow is still travelling the spirals of air, sensing a defined blood on its ice-cold tip. For a moment I am with it, high above these porous lands, edging the sea, its waves crashing endlessly below. Above the shabby villages and brutal tribes, leaning towards the wilderness and the dark forest which cloaks its meaning. The pain calls me back as I stand before the track, dazed in the garden. The inside of my arm is raw from where the bow string lashed it, removing a layer of skin with the ease of a razor, indifferent and intentional. Stepping forward, I pick up my sack and quiver, steady my looping stance against the bow and walk forward into the wilderness. The land has become depopulated. Too much effort is needed to keep the parched fields active enough to grow clinging tomatoes and dusty, dwarfish melons; it is a country of the old, tending their patches of earth out of habitual purpose, the last days of the clock ticking through daily ritual, the weights almost unwound from their creaking spool. There are no young people to reset it, no one to wind the well each day and sprinkle the ravenous earth into function. The young have left for the cities and for slave labour abroad. They are underground, digging fossils for other people’s heat. They are in venomous sheds, weaving chemical cancer. They are automata in chains of industry which do not need identity, language or families. All their saved money is endlessly counted as escape. Some come back to the fields to help the old and infirm raise the dented bucket and spade; others attempt to return as princes, buying expensive and bland new homes in the crumbling villages of their origin. This will fail, and their children and the land will turn on them and intensify the shuddering fatigue. The scuffed tracks of their efforts are erased under my feet, walking through the few occupied remnants of community. It will take me three days to clear these places, another three or four to cross the low mountains and be further out at the rim of the wilderness. We had lived in this place for eleven years, healing the gashes and fractures of our past, using the sun and dust to staunch the jagged memories. This peninsula of abandonment had given much, and a part of me ached to plan a return, even though I know it will never be possible. The heat of the day has become saturated with weight, the brightness sullen and pregnant with change. Clouds have thickened and coagulated with inner darkness; water is being born, heavy and unstable. This is the breath of the sickly wind called Burascio by the natives of the land; a wind which sucked rather than blew, its hot, inverted breath giving movement but not relief. It toys with expectation by animating suffocation, tantalising the arid earth with its scent of rain, whilst beneath the reservoirs, caves and cisterns strained their emptiness towards its skies. This was the reason we had lived here. Este said the isolation was part of the treatment, but the mending and evolution of the body and spirit could only take place above a honeycomb of hollows. The skies and the sea would be heard in those places. Their vastness and motions would be echoed down beneath the taut earth, swilling and booming the darkness into quiet against their unseen mineral walls. She spoke of their unity of voice, from the humblest well to the vastest cathedral cave, how they are like pipes of different sizes in a mighty organ. An organ constructed to shudder in fugues and fanfares of listening, not playing; where a cacophony of silence was only counterpoised by insistent drips of water. She knew it was their action that influenced the minute physical and the immense mental and spiritual spaces inside human beings. I think of this as I walk across the lid of their meaning, of her unfolding these wonders to my baffled ears. I think of her voice, very close, very clear, and I stare in shock at the truth of holding her bones and flesh in my sweating hand. lizards, flies and cacti, the human signatures were being erased. My shelter feels like it has not been used for years, the stitched- together sacking that made its rudimentary door falling apart in my hand as I try to unhook it. This crouching space had been scratched out from the soft yellow stone, just big enough for a small man or boy and a few goats. There are still remnants of occupation: a low bed or table blocking the far end; a few tools bearing the labour scars of generations; a car wheel, its tyre worn smooth; dry, sand-encrusted empty bottles and a few exhausted shotgun cartridges. Hanging on a nail is a fragment of rusted armour, an articulated breastplate of diminutive size. Whether this is a genuine artefact dug up from some unknown battle, or part of a carnival costume from one of the gaudy pageants that once marked the saint’s passage through the year, it is impossible to say. The hot land and the salt wind have etched and cooked it into another time, a time that never stained memory, because it was too ancient to have yet been conceived. The cave’s bare interior seemed at once empty and brimming with occupation. I curl into the sanctity of this most human shelf, and taste the joy of its simplicity with the edge of my sudden tiredness. 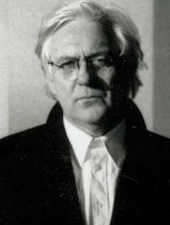 Brian Catling was born in London in 1948. He is a poet, sculptor and performance artist. He has published eleven books of poetry, the most recent being A Court of Miracles. Collected Poems of Brian Catling (Etruscan Press, 2009). Poems also appear in many anthologies including The New British Poetry, Paladin Conductors Of Chaos, and Picador Anthology of Twentieth-Century British and Irish Poetry, (Oxford University Press, NY; editor Keith Tuma). He is Professor of Fine Art at The Ruskin School of Drawing & Fine Art, University of Oxford, and a fellow of Linacre College.